I know it's been a while...we've been a little busy with school, work, the appearance of a little tooth, and the appearance of another little tooth. 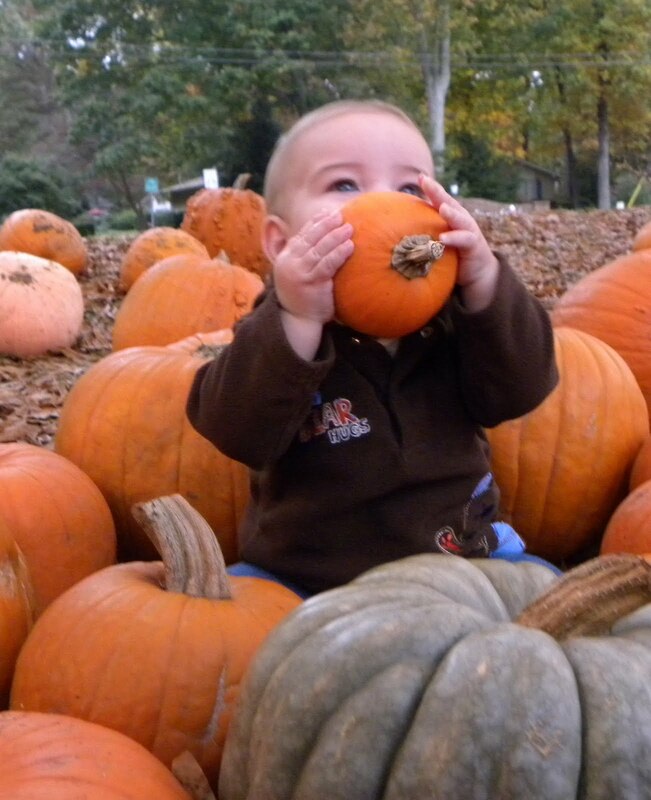 This teething process is just so much fun, let me tell you! The little dude looks so darn cute with the 2 little teeth poking out, though. 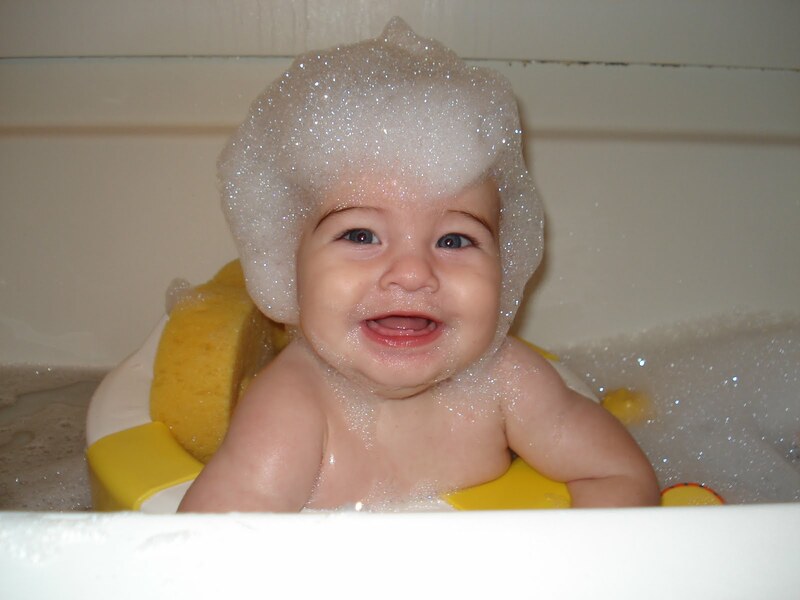 Unfortunately for me, along with teeth and solid foods comes less dependence on mommy! Ande has taken it upon himself to ween from breastfeeding. I thought I would be jumping for joy when this happened, but I'm so sad! Luckily, he is still totally and completely a "mama's boy." For now. 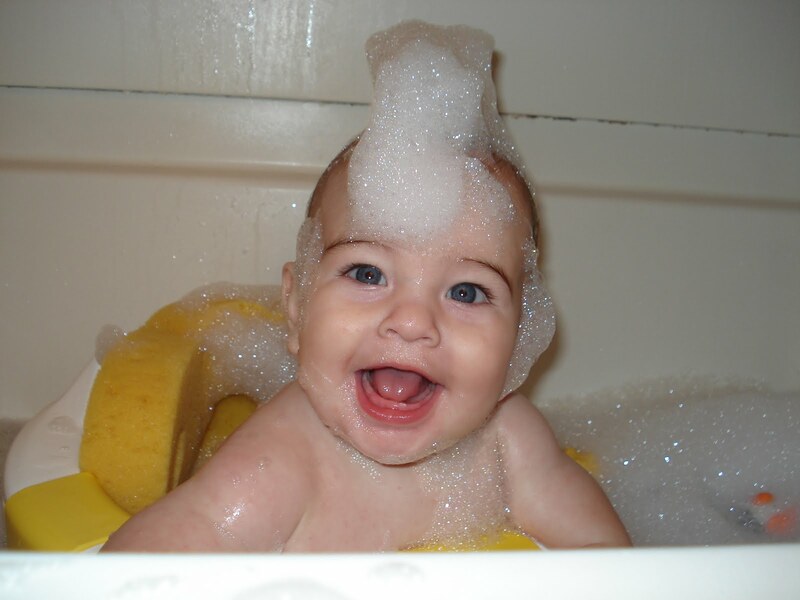 His Daddy, however, never fails to make him laugh and give him a good time. Especially in the bath! 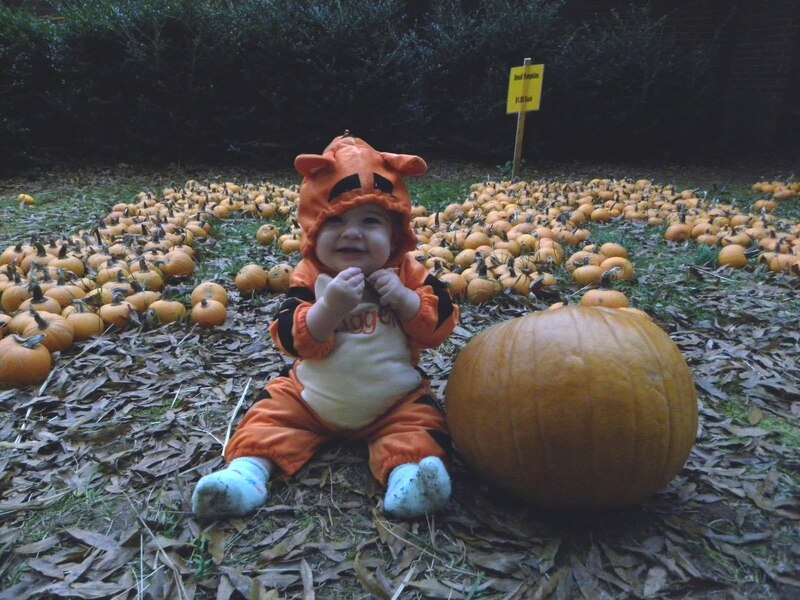 And here we are, the long awaited Halloween pictures! 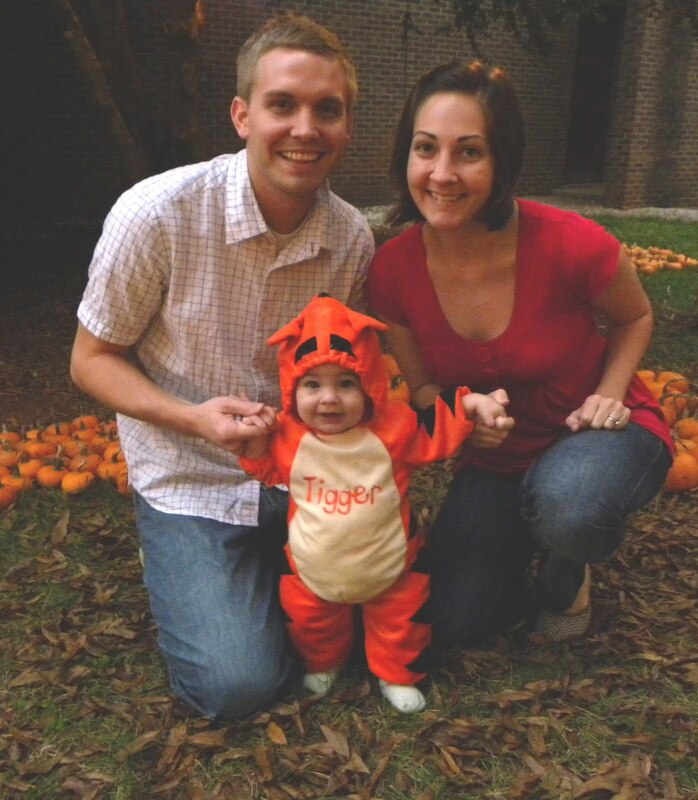 We of course think Ande is the cutest Tigger of all time, so we took him to the ward Trunk or Treat basically just to show him off. 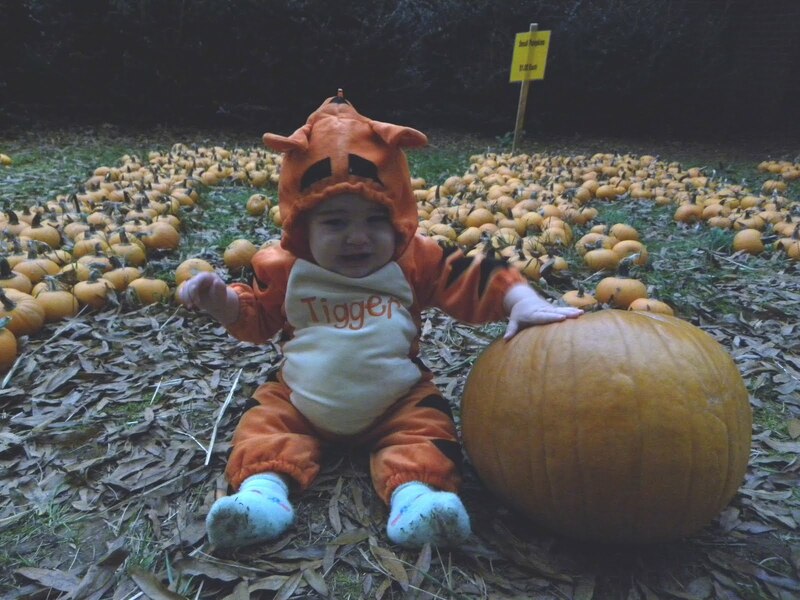 Once there, we found Ande was one of several cute little Tiggers and we ended up feeling a little out of place. 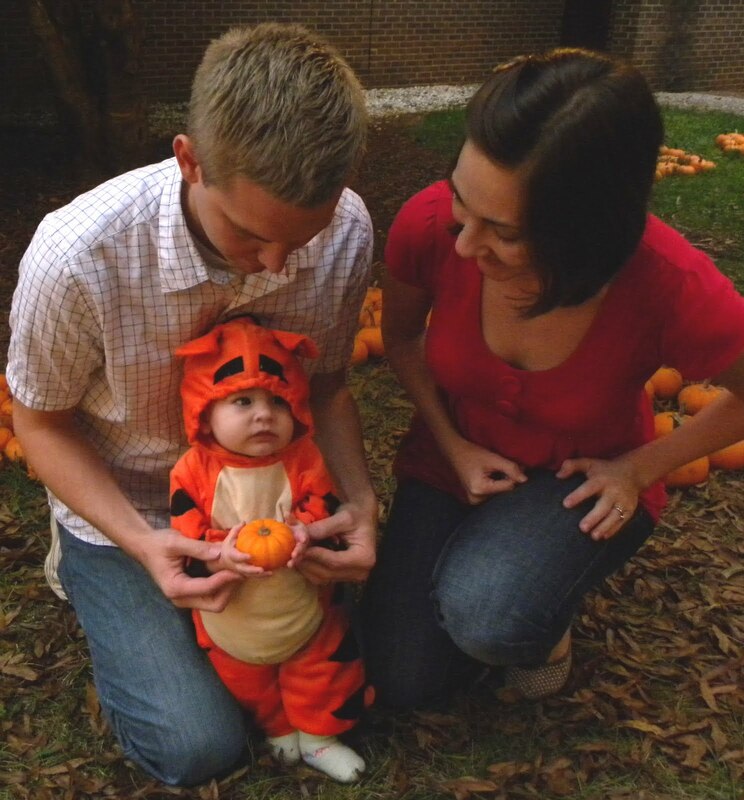 What is there to do at a Trunk or Treat when your kid can't walk or eat candy? 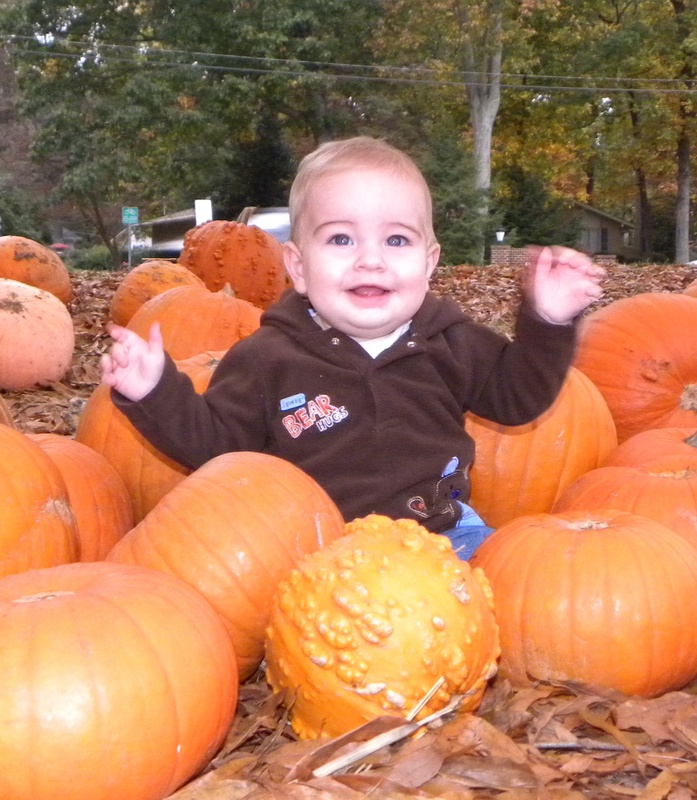 We also took Ande to a pumpkin patch on Friday before Halloween. 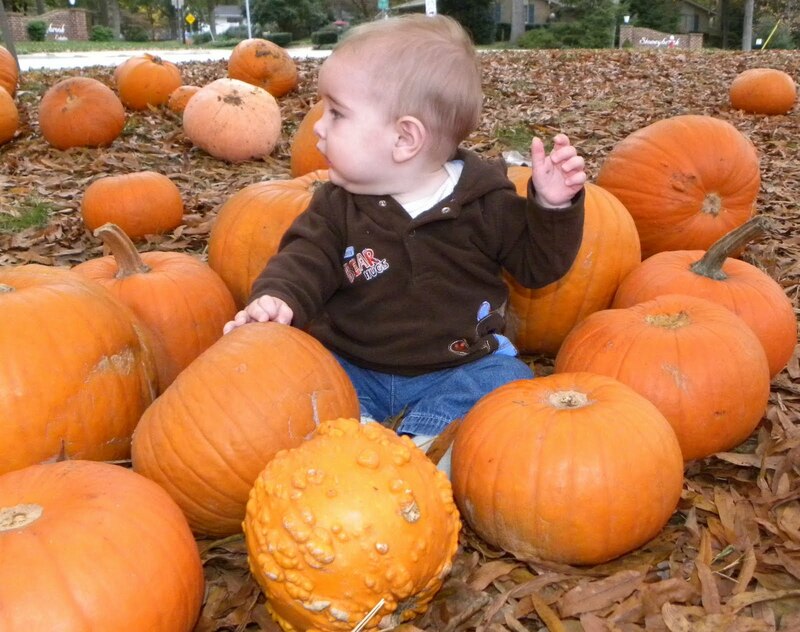 All the good pumpkins were already taken, the only ones left had a bunch of warts all over them. We decided to have a photo shoot with Ande anyways. Until he realized there were leaves on the ground all around him. 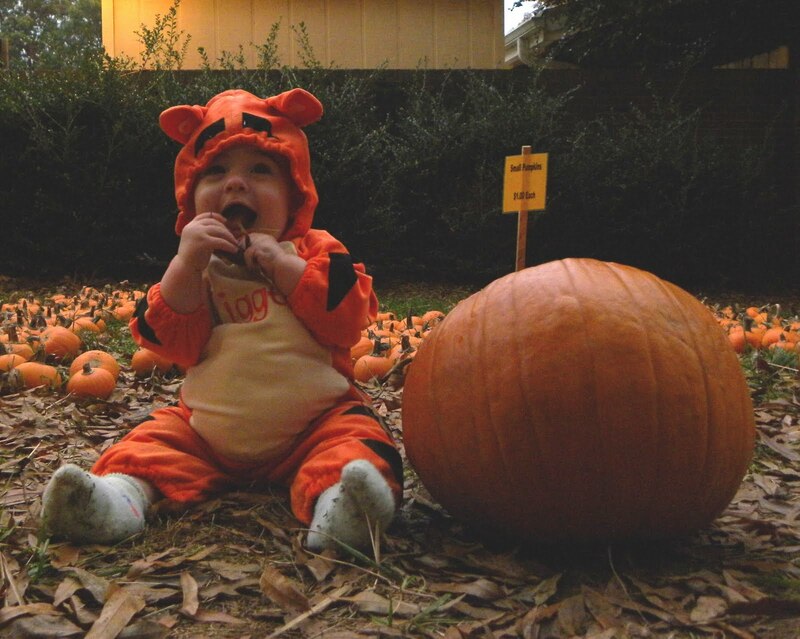 For some reason Ande thinks leaves are delicious because this is not the first time that he has ingested one, or two. 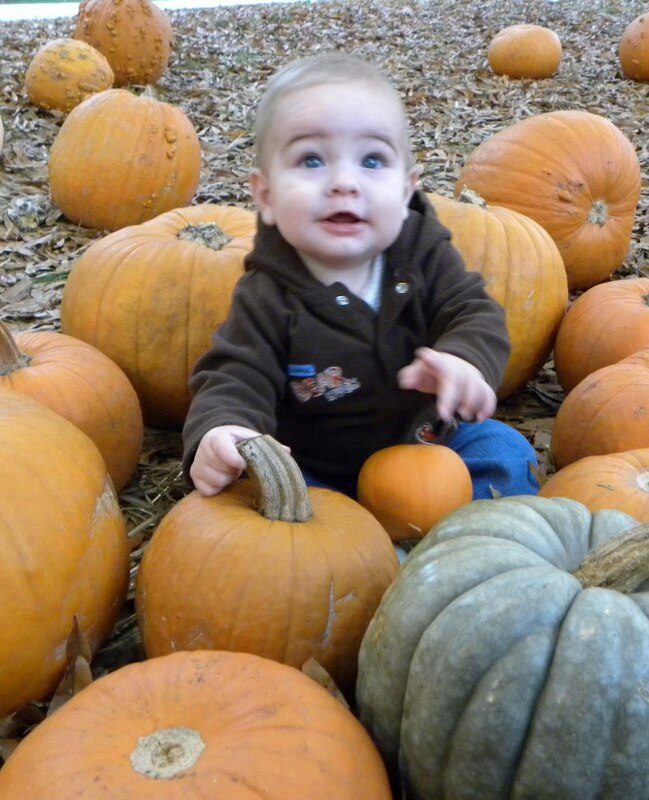 On Halloween we took Ande Trick or Treating, but only to his Grandparent's and then his Great Granny's houses. We sat him on their porches, rang the door bell, and then we hid. 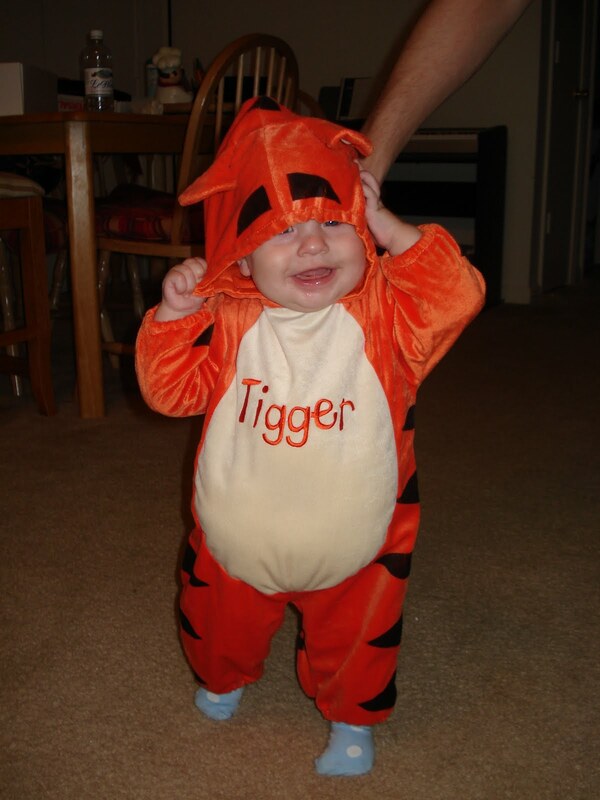 They thought it was pretty funny when they opened the door and little Tigger was all they saw! 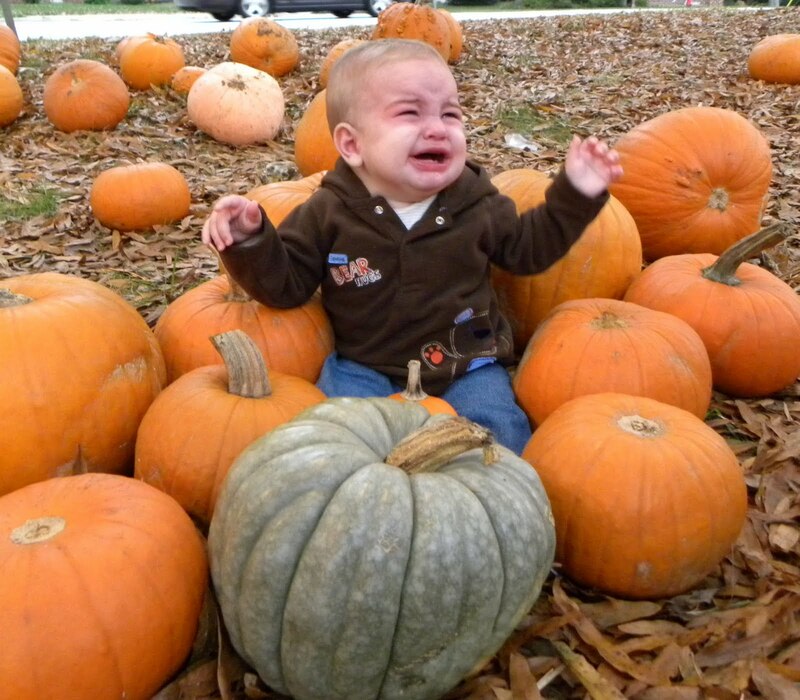 That's so funny about the trick or treating. I wish I could have seen him! Funny stories. I like the hair. I'll have to tell court to check it out. 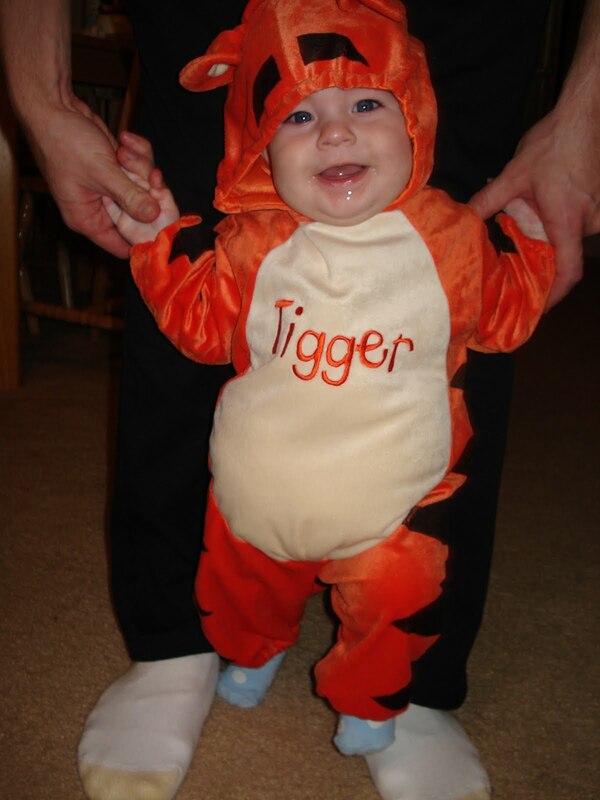 cute little tigger. we would've loved to open the door and find Ande there.